Bergman was born on February 2, 1947, in Shakopee, Minnesota and received his undergraduate degree from Gustavus Adolphus College in 1969. He subsequently earned an M.B.A. degree from the University of West Florida. His formal military education includes Naval Aviation Flight Training, Amphibious Warfare School, Marine Corps Command & Staff College, Landing Force Staff Planning (Marine Expeditionary Brigade [MEB] and Air Command Element [ACE]), Reserve Component National Security and Naval War College Strategy & Policy, Syracuse University National Security Seminar, Combined Forces Air Component Command, LOGTECH, and CAPSTONE. Bergman was commissioned a second lieutenant in the Marine Corps Reserve in 1969 under the Platoon Leader School program after his college graduation. He flew CH-46 helicopters with HMM-261 at Marine Corps Air Station, New River, North Carolina, and with HMM-164 in Okinawa, Japan, and the Republic of Vietnam. Assigned as a flight instructor, he flew the T-28 with VT-6, NAS Whiting Field, Florida. He left active duty in 1975 and flew UH-1 helicopters with the Rhode Island National Guard, Quonset Point, Rhode Island. Following a 1978 civilian employment transfer to Chicago, Illinois, he transferred from the Rhode Island National Guard back to the Marine Corps Reserve, where he served in several 4th Marine Aircraft Wing units at NAS Glenview, Illinois: HML-776, flying the UH-1; VMGR-234, flying the KC-130; and Mobilization Training Unit IL-1. He was selected to stand up the second KC-130 squadron in 4th MAW and, in 1988, became the first commanding officer of VMGR-452, Stewart Air National Guard Base (ANGB), Newburgh, New York. From 1992 to 1994 he commanded Mobilization Station, Chicago — the largest of the 47 Marine Corps Mobilization Stations. During 1995, he served as a special staff officer at Marine Corps Reserve Support Command, Overland Park, Kansas. In 1996, he became chief of staff/deputy commander of I Marine Expeditionary Force Augmentation Command Element, Camp Pendleton, California. In late 1997, he transferred to 4th Marine Aircraft Wing Headquarters, New Orleans, Louisiana, to serve as assistant chief of staff/G-1. Promoted to brigadier general, he became deputy commander of the 4th Marine Aircraft Wing. Transferred in June 1998 to Headquarters, Marine Forces Europe, Stuttgart, Germany, he served as deputy commander. Recalled to active duty from April to July 1999, he was dual-hatted as EUCOM, Deputy J-3A. He then commanded II Marine Expeditionary Force Augmentation Command Element, Camp Lejeune, North Carolina, until assuming command of 4th Marine Aircraft Wing, New Orleans, Louisiana in August 2000. In September 2002, he assumed command of the 4th Force Service Support Group, New Orleans, Louisiana. He also served as chairman of the Secretary of the Navy's Marine Corps Reserve Policy Board from 2001 to 2003. Returning to active duty in October 2003, he served as director of Reserve Affairs, Quantico, Virginia. He began his final assignment, command of Marine Forces Reserve/Marine Forces North, on June 10, 2005. He relinquished that command in October 2009, and retired from active duty in December of that year. Bergman won the Republican primary in Michigan's 1st congressional district in August 2016. He defeated Democratic nominee Lon Johnson and Libertarian nominee Diane Bostow in the November 2016 general election. Bergman, who was elected to succeed retiring Republican Representative Dan Benishek, won 55% of the vote to Johnson's 40% and Bostow's 4%. The district covers the entirety of Michigan's Upper Peninsula and the northern part of the Lower Peninsula. Rep. Bergman assumed office on January 3, 2017. He is a member of the Republican Study Committee, the Climate Solutions Caucus and the U.S.-Japan Caucus. Rep. Bergman was an original co-sponsor of H.R. 3949, VA Prescription Data Accountability Act 2017, which became law during the 115th Congress, 1st Session (2017). The bill helps protect veterans receiving prescription medicines and prevents misuse of such prescription medicines. In June 2017, Bergman was one of the Republican congressmen who were practicing on an Alexandria, Virginia, baseball field for the annual congressional baseball game when a man named James Hodgkinson began shooting at them, harming four people, including Cong. Steve Scalise (R-LA). Bergman "was about to take the batter's box when he heard the first shot." Not knowing how many shooters there were, "I just basically went into a low crawl and crawled behind the first base dugout and listened... It appeared as though the shooter was moving around the outside of the perimeter moving towards the backstop, so once that was the situation then I along with a couple of other folks who were behind the dugout crawled around and went down into the dugout in case the shooter came all around behind the backstop." Afterwards, Bergman blamed the incident on anti-GOP rhetoric. "The hateful rhetoric serves no positive purpose, in fact today it obviously served a negative purpose, but unfortunately, and I'm looking at all the media in the eye when I say this: Friendships and cordial relationships don't make good news," Bergman said. "So, I can tell you, especially as president of the freshman class of Republicans, we are united along with our Democratic freshman counterparts to bring civility back to the 115th Congress." Asked if he was blaming the media, Bergman said, "I think the media is complicit if they keep inciting as opposed to informing." In a July 2016 television interview, Bergman said his three top priorities were to "get Congress working together" instead of being preoccupied with partisan division, to "utilize the Constitution," and to pass a balanced budget amendment. In May 2017, Bergman co-sponsored the MacArthur Amendment, which would eliminate healthcare exemptions for members of Congress that were permitted under the American Health Care Act (AHCA). "We are all equal in the eyes of the law," Bergman said, "and as Members of Congress, we are obligated to live by the standards we set for the American people. In the context of health care, that means coverage should be available to Representatives and our staffs on the same basis that it's available to our constituents." In an August 2017 interview, Bergman "critiqued politicians who have not served in uniform for making misguided military policy decisions." He said that in order to have the kind of political leadership that is needed in regard to military policy, "you really have to have those people who were boots on the ground. There are a lot of people who really think they are making good decisions as it relates to the military who have no clue what the ramifications of that decision are because they have never been part of it." Bergman sided with President Trump that transgender individuals should be barred from the military. "The U.S. military is not a social experiment," he said. He added: "I do not support elective surgery of any kind, zero federal dollars spent on elective surgery. I'm all about readiness and winning the fight. Anything that challenges unit cohesion is counterproductive and people get hurt." He considers himself a conservative but does not feel strongly about party. "As a senior military officer, I could not be part of a political party," he has said. "[S]wearing that oath to the Constitution, and being in uniform, we represent everyone, not just some." Bergman lives in Watersmeet, Michigan  with his wife Cindy. They have eight grandchildren. ^ Livengood, Chad (January 14, 2016). "Retired U.P. Marine files for GOP congressional primary". Detroitnews.com. Retrieved April 12, 2016. ^ a b Gibbons, Lauren (August 2, 2016). "Jack Bergman victorious in 1st Congressional District Republican primary". MLive. Retrieved August 3, 2016. ^ "Medium- Lt. General Jack Bergman (Ret.) to Become Highest-Ranking Military Veteran Ever Sworn into Congress". Harperpolling.com. January 3, 2017. Retrieved January 10, 2017. ^ "Michigan U.S. House 1st District Results: Jack Bergman Wins". The New York Times. November 15, 2016. Retrieved November 15, 2016. ^ Bennett, John (November 9, 2016). "New Member: GOP's Jack Bergman Claims Michigan's 1st District". Roll Call. Retrieved November 15, 2016. ^ Ann, Kuster, (November 21, 2017). "Cosponsors - H.R.1545 - 115th Congress (2017-2018): VA Prescription Data Accountability Act 2017". www.congress.gov. Retrieved May 25, 2018. ^ "Valor Awards for John W. Bergman". Military Times. Retrieved March 16, 2015. 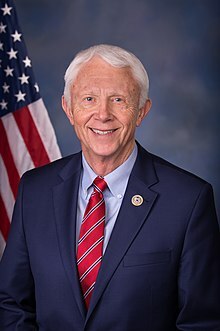 ^ "Biography - U.S. Representative Jack Bergman". bergman.house.gov. This page was last edited on 12 April 2019, at 03:58 (UTC).